If you visited Hungary before 1990 one of the fondest memories you will have is munching on lángos, fresh fried bread eaten as a snack. Lángos are yet another one of the Hungarian flavors that are fast receding into memory as Hungarians discover both healthier ways of eating and more ways to tax frybread shacks into non-existence. Lángos is not food for modern people. Lángos is not good for you. Lángos will never become a fad in Manhattan bistros. But if you eat a lángos at the age of ten, you will crave them for the rest of your life. Lángos is simple, fried dough. 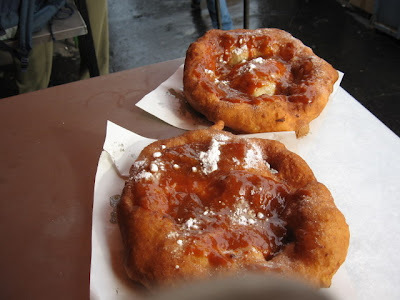 Fried dough is eaten all over the world in some form or other. The same artery-clogging recipe is the basis of North American Indian reservation cuisine, known as frybread. Placed on reservations, Native Americans had to make do with the survival rations supplied them by the US government, which meant a monthly sack of flour and some lard. The result was frybread, eaten on almost every reservation west of the Mississippi, as well as a lot of very fat, unhealthy Indians, because frybread became a daily staple to people who had been hunters with a very low tolerance for carbohydrate fried in fat. In Hungary fried dough never became a household staple - it was something you ate on the run, usually at markets and bus stops. It is the original Hungarian fast food. Above is our favorite lángos shack, located in the back corner of the Bosznyák ter produce market in Zugló (at the end of the 7 bus line if you are coming from downtown Pest.) Now, I don't advocate eating lángos every day, or every week, even, but then it has been almost two months since I have eaten anything with any carbohydrates at all, so at least I can dream, can't I? These are lángos as they are meant to be: fried on order. The dough is a flour and yeast dough with the addition of mashed potato - yes, spuds. At this stand, you can even find little bits of potato defiantly unmashed in your lángos. The classic lángos is plain with salt and garlic water - which you splash on from a jar at the counter. More modern variants include the sour cream lángos, the sour cream and cheese lángos - made with a grated topping of the indestructable and unmeltable factory produced trappista cheese that rules the cheesy roost in Hungary - and the truly distressing "pizza" version in which you squirt sweet Hungarian ketchup all over the last version, making the messiest snack in the world. Don't try this at home! I tend towards the sweeter version: lángos with home made lekvár jam, usually either plum or apricot. The lekvár is usually more tart than sweet, and when I wake up to find the home bereft of breakfast goodies I hop on my bike and zip on over to Bosznyák ter and go straight to the lángos stand for a jam lángos and coffee - the whole breakfast special for only about FT 200 (US$ 1.30) complete, making this one of the last cheap meals available in newly inflated East Europe. This stand is what you see as soon as you get off the #7 bus at Bosznyak ter. It serves a somewhat inferior product to the stand in the back of the square, so fight your impulses, and head into the market itself. Besides, they also serve something called "Argentine Palacsinta" which is too scarey to investigate. Stands like this used to be found almost everywhere in Budapest, but no longer. I was happy to see that frybread stands are still common in Miskolc and other towns in the countryside. It doesn't take much to make lángos. A portable oil fryer, a dish rack to let them drain, and a bath basin full of rising tater dough and you are in business. 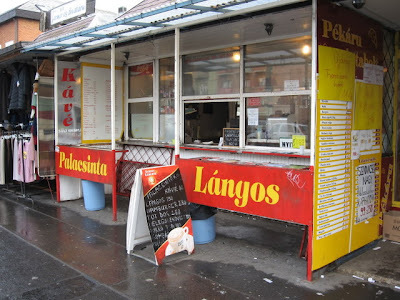 Lángos shacks were a part of the city landscape in Budapest until about 1992. You would find them set up at bus stations on the main intersections, at Metro stations, and always at markets. The city set about "cleaning up Budapest" and the first things to go were the dismal-but-delicious snack shacks selling lángos, strudels, and fried sausages. Then came stringent tax laws which tended to edge out those vendors whose products were based on incredibly small profit margins. Frying dough does not make you as rich as selling pizza by the slice does. Goodbye dough. It is now hard to find a lángos seller in Budapest outside of the outdoor produce markets. There are bad lángos: these are from the fancy market at Szena ter, near the Mammut shopping Center off of Moszkva ter. Dry, greasy, no trace of the yeasty spudsy discs of heaven that we come to expect. Lángos for tourists. Sad, really. If you aren't near Zugló, try making it at home someday... just joking. There is a similar thing here in Ottawa called Beavertails. It's mostly marketed to tourists in winter but I certainly have a sweet spot for it. I did not eat a lángos until 1996 but still no sojourn in Hungary will be truly complete without one. (One usually does it unless I am there more than three months, which is not all that often.) I have mostly associated them with my jaunts to the Ecseri piac but have settle for a greasy stand at Örs vezér tér... will have to try your recommendation, though. To me the sweet lángos is too much like the elephant ears of the midwestern state fair, though. Gotta have it with runny sour cream and garlic. That way it's "dinner" and not "dessert"
I just finished a gulosh and lungos lunch my wife bought me this weekend at Our Lady of Hungary Festival in South Bend, IN. You don’t have to go to Budapest, just have family that still uses the recipes from there.